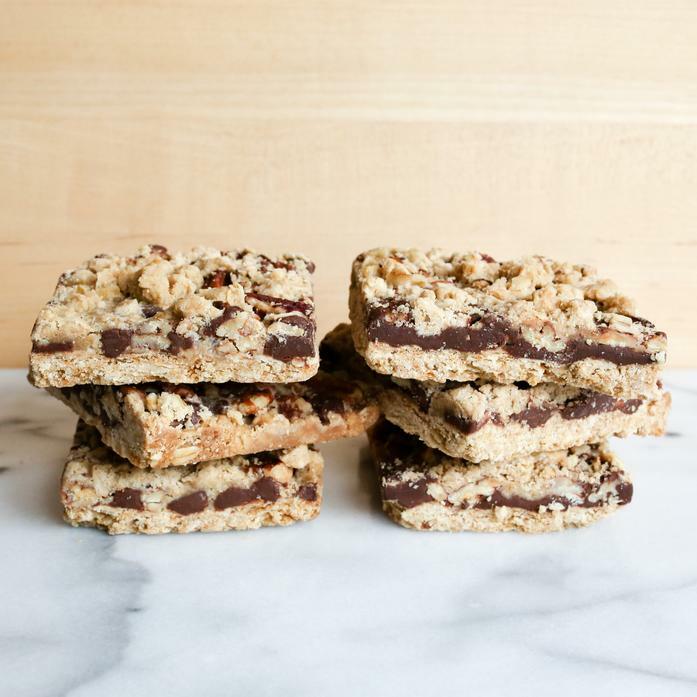 Our signature treat starts with an oatmeal brown sugar cookie base, which is topped with toasted pecans and decadent chocolate bits. All of this is then bathed in a brown butter salted caramel sauce and baked to marry the flavors together. Featured in Food & Wine Magazine Holiday Gift Guide 2015, and Editor’s Top Ten Picks, February 2013. Ingredients: Fresh creamery butter, oats, pecans, semisweet chocolate, brown sugar, flour, vanilla extract, leavening, fleur de sel, fresh cream. Each order contains 6 bars, each 3" x 3"